Dr. John P. McTague has had notable careers in academia, government, and industry. He earned an undergraduate degree with honors in Chemistry from Georgetown University in 1960 and a Ph.D. from Brown University in 1965. Dr. McTague began his professional career at the North American Rockwell Science Center and then joined the UCLA Department of Chemistry as an Assistant Professor in 1970. He soon rose to the rank of professor and became a member of the Institute of Geophysics and and Planetary Physics. Dr. McTague's seminal research on the dynamics and interactions of condensed matter included the first observations of collision-induced light scattering, magnetoviscosity in magnetic colloids, and the collective dynamics of monolayer films. His theoretical and computational work highlighted the unique role of the body-centered cubic phase in crystallization and of the existence of orientational epitaxy in incommensurate films. 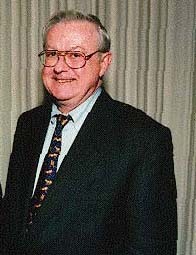 In 1982, Dr. McTague became the first cdhair of the National Synchrotron Light Source at Brookhaven National Laboratory. He then served at the White House as Deputy Director and then Acting Director of the Office of Science and Technology policy. In 1986, Dr. McTague joined the Ford Motor Company where he spent more than 12 years, first as Vice President, Research and then Vice President, Technical Affairs. At Ford, he established USCAR, a unique research collaboration involving Ford, Chrysler, and General Motors. Dr. McTague is Chairman of the Board of Overseers of Fermi National Laboratory, serves as Co-Chair of the Department of Energy's Advisory Board. He is a member of the National Academy of Enngineering and a Fellow of the American Physical Society and the American Association for the Advancement of Science. He was awarded an honorary doctorate from Brown University in 1997, and, in 1998, he was the recipient of the Pake Prize of the American Physical Society.